Today the Vinegar Mill is one of the nicer shelter areas in Indiana. The history of this area was an up and down ride from pioneer creativity to State Park enjoyment back down to neglect and misuse and back up again to a highlight of the area culture. 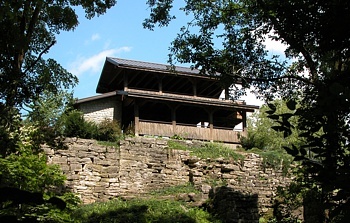 Unlike the name, the mill was made to cut limestone from the surrounding canyon area. The acquired name Vinegar Mill has two possible origins, which we will explain subsequently. The origin of this mill site date back to approximately 1840. William Read was an industrious pioneer and was the original proprietor of the Mill. William's first operation was staged a bit (100 feet) upstream from the second mill. This operation used a side shot water wheel much like the traditional mill you may visualize. Upon a rock base on the east side of the creek stood the wheel hub as it stretch across to the other bank. Water flow has controlled by the still existing dam upstream. This operation continued for about seven years till William begun building a second mill at the mouth of the stream and the canyon creek. The construction at this first mill was never very elaborate. 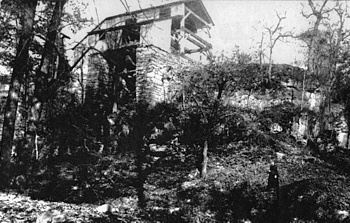 Ruins of this original mill do exist, yet are not in very good condition. It is possible to see the base at its location though. Ruins of the second mill are fairly extensive, and it is possible to get a good feel for the working of this stone cutting operation. The mill was located right on the edge of the cliff and somewhat over the edge as the well shaft was built upon the lower stone cliffs. This mill used a different strategy for power. Within the well shaft on the west side of the mill was created a endless chain of buckets connected by rope or cable and strung around two guiding wheels, one at the top and one at the bottom. Water was carted from the dam to the mill site and fed into the buckets that would use gravity to pull the cable and thus power the mill. It is hard to fathom how slow this process must have been considering they where cutting stone. It was reported that the mill had the first stone cutting blade in action in Indiana. Although this claim has not been verified, it definitely was one of the first. "One day a hunter was practicing his trade along the banks of the Muscatatuck River when he came to witness William Read building his original mill. The hunter asked, 'what are you trying to make?' Mr. Read, not desiring to disclose his plans, without looking up, said, 'If you stay here long enough you may find out.' The hunter tarried a short time, then went his way to the nearby town of Vernon where he joined the ever present congregation of loafers. In detailing his hunting experience of the morning, he mentioned that he had stopped at the new mill on his way back. A bystander asked what the were going to make at the new mill. He replied, 'Damned if I know, but from the way the boss talked I think it will be Vinegar." From that casual remark and the acid disposition of the owner of the mill, he became known among the wags of the community as 'Old Vinegar', and the mill took the name of Vinegar's Mill and in turn Vinegar Mill. In time the name attached so completely to the mill that it displaced all other names, and is so known today." Other sources dispute this origin and claim that the name simply came from the fact that the mill site looked much like a cider press. During this era, the upper mill site was known as "Lover's Point." There was at that time a prominent rock feature that was a stage area for dances and get togethers, as well as, more intimate affairs. The stone in this area was quarried to look much different then what was originally there. One tale explains how some of Morgan's Raiders took over the mill for a short period while they were traveling through on their Civil War mission. The mill set idle for a awhile, yet remained a popular attraction for locals. In the Early 1900's there was a growing awareness of the environment and this was the beginning of Indiana's state park era. Vinegar Mill's State Park was adopted as Indiana's fourth state park in 1921. Soon after in 1922, the Park changed Its name to Muscatatuck State Park. The Vinegar Mill was the highlight of the state facility. The area received a large amount of stonework from the WPA /CCC workers. The easy access gained by the stone stairway down to the river was great for fisher people as well as those wanting a nature hike. The area remained a popular spot for lovers and lovers of nature. In 1968 the Park was handed back to the residents of Jennings County. Although the Park was designated (by the transfer deed from the state) to remain exclusively used for recreational purposes, the county adopted the upper level of the Vinegar Mill site to be used as a cinder storage area for the county highway department. The lower level was used to a degree during this operation also. Because of this operation, refuse began to collect over the 80 foot hill/cliff and collect at its base. This operation ran for over fifteen years. In 1990 the Jennings County Park Board had had enough and began a movement to rid the park of this unsightly misuse of a once aesthetic recreational area. While fighting continued within the small county government as to the legitimacy of the cinders, the Park board took the matter to higher authorities, thus bringing in the EPA. As you can imagine, this caused a bit of friction. Eventually the EPA was set to fine the county for improper storage of environmentally damaging materials. Salts which were added to the cinders to melt ice on roads were leaching out of the material and into the area and river. Fines by the EPA were going to be issued, somewhere in the range of $15,000 a day if the county did not get the material properly stored. Luckily the county did not incur any additional losses and the cinders were removed in 1992. The mill site stayed basically the same till the early winter of 1998, when trees were removed from the existing ruins. In 1999 the Parks Department was awarded a Lilly Endowment Inc. Phase Four Community Involvement grant via the Jennings County Community Foundation. This grant, plus a little supplemental money from the Park and the County Commissioners, put about a quarter million dollars into cleaning and creating the now beautiful Vinegar Mill area. 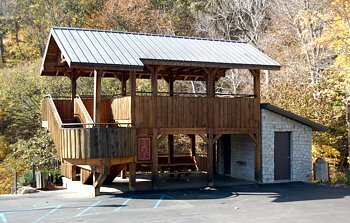 The shelter here was loosely modeled after the original mill. The engineering firm Fewell, Petitt, Bender, and Hauersperger of North Vernon were responsible for the design and construction was done by L.L. Brown from Scottsburg, IN. Bernie Hauersperger and Park Director Greg Martin (with some fine tuning by the community) did much of the brainstorming to create this unique recreational area.